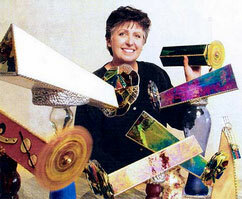 Glass kaleidoscope artist Kathleen Hunt resides in the "low country" of South Carolina, but she lived in southern California most of her life with a short detour to Arizona. She graduated from California State University at Long Beach and taught high school. The art of glass has always fascinated Kathleen with its diversity. She made stained glass windows and skylights for fifteen years before discovering the wondrous images she could create in a kaleidoscope. Kaleidoscopes have been her primary focus ever since. Recently, Kathleen has produced dichroic wall art and dichroic jewelry. Her kaleisocopes are internationally collected by galleries throughout the United States, Japan and the United Kingdom.